Y1706 Golden Retreiver 18 in. Y3782 Roscoe Pup 10 in. Y1715 English Cocker Spaniel 12 in. Y1724 Sheltie Sitting 11 in. Y3625 Yorkshire Terrier 6h x 12 in. Y3630 Cocker Spaniel 12 in. Y3772 Golden Retreiver 14 in. GC26 Hound Pup 11x3 in. GC25 Hound 19 x 4 in. Y1727 Yorkshire Terrier Sitting 12 in. GC22 Persian Cat - 8 x 8 in. Y1803 Curly Tail Cat 12 in. M029 Crouching Cat 10.5 in. M065 Stone Cat 9x6.5 in. Y1804 Sleeping Cat 4x10 in. 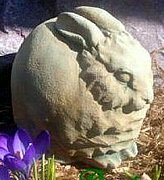 Y152 Rabbit Sleeping 5.5 in. Y154 Small Rabbit 6 in. Y1902 Flat Earred Rabbit 10 in. Y1913 Molly 7 x 11 in. Y1923 Standing Bunnies 13 in. M055 Flop Eared Bunny 14 in. M078 Bunny 3 x 5 in. 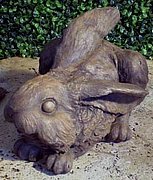 Y3770 Rabbit Standing 14 in. 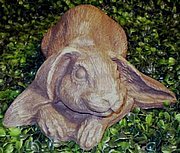 Y1904 Rabbit Standing 10.5 in. Y178 Funky Squirrel 3.5 H x 4 in. GC23 Chipmunk - 6x6 in. GC17 Drinking HH 10 in. HH12 Lovers 9 x 9 in. AL71 Chick on Egg 4.5in. M111 Bluebird 3 x 1.5 in. Y1519 Dove 5 x 7 in. Y1538 Nestled Dove 6 in. GC30 Owl on Branch 9 in. Y155 Tiny Owl 5H x 4 in. GC20 Pig and Piglets 7 in. GC27 Large Turtle - 12 x9in. Y3776 Franklin Turtle 7 in. AL44 Frog on Log 7in. Y126 Toad on Slate 5 x 5 in. Y165 Sleeping Toad 4.5 in. Y3774 Yoga Frog 8Hx12 in. Y3786 Spotted Frog 7 in. ST14 Lion Plinth 11.5 x 5 in. Y177 Crocodile Head 14 L x 5w in. M073 Horse Head 3D Hanger 12 in. Y175 Bubble Fish 5H x8L x5W in. M061 Pond Fish 6 x 6 in. Y145 Mouse and Cheese 2.5Hx5 in. Y3650 Dove 5 x 7 in.